Daniel, Revelation, Jesus, Health... Several different series of totally FREE Colorful Bible Studies. Discover answers to the questions that affect your life and happiness! 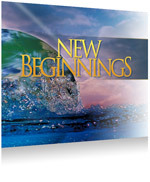 Whether you're just beginning your study of the Bible or feel its time for a review, the New Beginnings programs will help you on your journey. Each colorful lesson begins with an amazing story from the Bible, which is then used to clearly explain Bible prophecy and reveal scriptural truth.